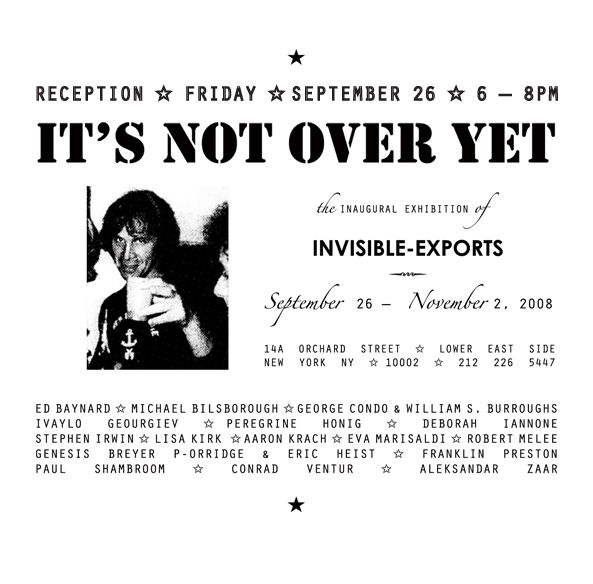 INVISIBLE-EXPORTS is pleased to announce its inaugural exhibition “It’s Not Over Yet,” a group show featuring both gallery and invited artists. The works gathered are mementos of the good times. They are a distillation of the aftermath of a party, like catalogued evidence from a crime scene. After a decade of booms and busts, careless art and scrambled politics, our sense of fun has shifted: distracting but with a dark, unavoidably political overtone. We throw parties because we don’t know what else to do, carousing loudly but hedging our bets. This is New York, several crashes deep. And oddly, no one seems to mind. Lisa Kirk, whose mixed-media work explores the aesthetic elements of terrorism and the boundaries of art as political commentary, offers a perfunctory apology, sincere but circumscribed, for “all the tourture and everything.” Aaron Krach’s piñata, constructed for this show and smashed at the opening, spews expensive candy, the broken pieces gathered and displayed, like specimens in a cabinet of curiosities. In a similar spirit of the morning after, Genesis Breyer P-Orridge & Eric Heist’s Candy Factory paintings examine the shadow cast by The Factory over a post-Warholian art world. Ivaylo Geourgiev also looks to Warhol, recreating the notorious lipstick vandalism of his painting Bathtub. In Eva Marisaldi’s video narrative, a one-robot-band traces the outskirts of a deserted seaside town before finally running out of steam. Paul Shambroom depicts an exploded Honda and a pristine Hazmat suit — accessories and armaments reshaped and reflected in the crucible of a burning world. This exhibition is a celebration, and a deconstruction of celebrations. The parties tell us we’re still alive, but the art says we’re still hard at work. It’s not over yet.